We are about 1 year into the redesign of the JAOS ordering application for Amcon, the optical supply company, and it finally feels like we are making some progress. This week we completed all of the different ordering methods, and they all seem to be working quite well. This was after going down the path of relying heavily on cookies to store orders in progress. Taking some time away from this project and returning to a different part of it using a different methodology made all the difference in the world. A launch date is planned for later this spring! JAOS is a customizable web-based online ordering system for larger (multi-location) customers. I built the first version of JAOS back in 2007 and needless to say – it’s looking pretty dated. And the code is a disaster. We cobbled on new functionality as needed and it’s kind of a mess. When I started building JAOS – I had no idea it would become such a key piece of the Amcon business. In fact – I named it JAOS after myself (Julie’s Awesome Ordering System) not really realizing that the name or the application would stick. 11 years later, millions of dollars of orders that have been placed through JAOS, so it’s high time for a reboot. The new version of JAOS will be responsive, and much more functional. The code is written more efficiently, and everything is well-documented. We are also doing a lot of testing as we build. 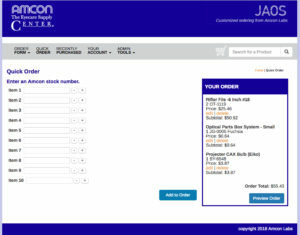 Amcon sales reps are already using the system to put through orders that are emailed or phoned in. Our big breakthrough this week was in figuring out we could reuse the code we had written for the Quick Order feature in many other areas of the site. We were able to replace the code in the main ordering feature with the code we wrote for the quick order and it is all working really really well. There is still a lot of work to be done but the accomplishments this week have pushed us over a big hump and given us faith that the end is in sight!